Anne Steele (1717-1778) has been recognized as one of the leading female hymnwriters of her time. 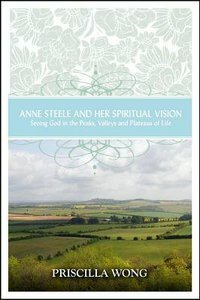 In Anne Steele and Her Spiritual Vision, Priscilla Wong demonstrates how Steele was able to see God in different circumstances of her life and expressed it in three main themes that can be found in her hymnody: the glory of God in creation, faith in the face of suffering, and hope in the promised glory. About "Anne Steele and Her Spiritual Vision"
Priscilla Wong is a desginer and visual development artist working at Dreamworks Animation, where she has contributed to films including Peabody and Sherman andPenguins. Her past clients include Laika/HOUSE, Psyop TV, and HarperCollins. She grew up in the deep brambles of Hunter's Point, San Francisco.